Pacemakers are used when the heart beats too slowly (bradycardia) or even stops for prolonged periods of time. This a very serious condition with high risk of death. An artificial pacemaker is indispensable to ensure that the heart doesn’t stop and that the heart rate is always kept high enough to allow a normal life. What causes the heart to beat too slowly (bradycardia)? The heart possesses a natural pacemaker (sinus node) which creates electrical impulses that are transmitted to the rest of the heart in an ordered fashion through a sort of “electrical wiring” – ultimately resulting in a heart beat. A low heart rate may result from either a malfunction of the natural pacemaker of the heart (sinus node disease or sick sinus syndrome) or a failure of transmission of the impulse to the rest of the heart through the “electrical wiring” (heart block). This may happen due to degenerative changes of these structures, or may be a consequence of other diseases that affect the heart function. In that case, it may be a reversible problem. For this reason, an extensive investigation is warranted in these cases. A full cardiac workup (including at least a heart scan and an electrocardiogram) is necessary to rule out primary cardiac disease and is accompanied by complete blood tests, and possibly chest radiographs, and an abdominal ultrasound scan in order to assess for the presence of a systemic disease (e.g. cancer). A pacemaker unit is composed of a small generator that delivers impulses to the heart through an electrical lead implanted inside the heart. The generator is usually implanted under the skin of the neck or between the shoulder blades in small dogs. The lead enters one of the veins in the neck up to the right side of the heart where its tip must remain in contact with the heart muscle to deliver small electrical discharges that will result in heart beats. Modern pacemakers are incredibly advanced. A pacemaker does not just “pace” the heart at a predefined rate. It is able to sense the heart’s own activity and will only pace if the heart fails to do so naturally. It is also able to adapt the heart rate to the degree of activity. For example, a pacemaker may be set to keep a resting heart rate of 70 beats/minute during the day and a lower heart rate during the night when the dog sleeps (e.g. 40 beats/minute). Additionally, during exercise, sensors inside the generator (e.g. movement sensors) will “tell” the pacemaker to increase the heart rate to meet the body’s demand (e.g. up to 140 beats/minute). All these parameters can be programmed and changed at any time. Pacemakers are implanted via a minor surgical procedure in which a small incision is performed in the skin on one side of the neck to allow access to one of the major veins (jugular veins). The lead is introduced in this vein and advanced to the heart. The other tip of the lead is connected to the impulse generator which is then placed under the skin. This procedure usually takes about one hour. No. The above procedure in itself may appear quite straightforward, however, anaesthesia poses a significant risk in these patients. Significant drops in heart rate are frequently observed during anaesthesia even in normal dogs. In a dog in which the heart rate is already too low, the effects of the anaesthetic drugs may cause the heart to stop completely. An experienced anaesthetist with access to advanced monitoring and pacing equipment is invaluable in order to successfully manage these cases. Fortunately, we have ways of reducing these risks considerably. Before administration of any anaesthetic drugs we make sure we are able to temporarily pace the heart if necessary, either by delivering an electrical stimulus via pads placed in both sides of the chest (transthoracic pacing) or by introducing a temporary lead in the heart via one of the peripheral veins (e.g. one of the veins in the legs). What happens after the pacemaker is in place? In order for the pacemaker to function properly the tip of the lead inside the heart must always remain in contact with the heart muscle. With time, as part of the body’s reaction to the presence of this lead, formation of scar tissue will ensure a secure attachment of the lead to the heart muscle (normally in 3-6 months). Until this occurs a sudden pull on the neck or trauma may cause lead dislodgement or even damage to the lead itself, which will cause the pacemaker to malfunction. In the first month, significant care is advised to avoid this problem. Rest at home with short walks on the lead is recommended. Jumping on or off the bed or sofa, or running up and down the stairs, is strongly discouraged. Naturally preventing these actions in dogs is very challenging. Since they feel better immediately after recovery from anaesthesia, they want to start running and playing again. Most of our patients are discharged on the day following pacemaker implant but strict rest is recommended during the first month. It is very important that frequent rechecks (every 6 – 12 months) are performed in order to assess appropriate pacemaker function and battery life. If the battery becomes low the pacemaker may malfunction or even stop working and therefore needs to be replaced. This means that a new surgical procedure is necessary to replace the generator by a new one. Will the pacemaker need to be replaced at some point? Pacemakers have a built-in battery that may last from 5 to over 10 years depending on usage. Naturally this will depend on how much the pacemaker has to work. In cases in which the heart is 100% dependent on the pacemaker, the battery will be depleted much sooner than if the pacemaker is working only 50% of the time or less. The amount of energy that is delivered to the heart is another contributing factor to battery life. In some cases, more energy is needed to stimulate a heart beat due to heart muscle disease, inflammation or scarring. This is different with each case and may also change during time. 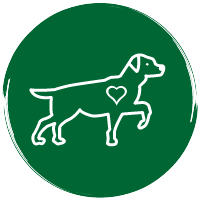 It is not very common to need to replace the battery in dogs since most pacemakers are implanted in older dogs in which the battery life outlasts their life expectancy. Rarely a pacemaker unit may malfunction and need to be replaced. Can my dog lead a normal life? Avoid trauma to the neck: Any trauma to the neck may result in damage to the lead or generator causing malfunction. Neck collars may be used for identification only. Cell phones: Most cell phones do not interfere with pacemaker function. As a precaution it is advised to avoid close contact. Bluetooth devices: These do not appear to interfere with pacemaker function. MP3 player headphones: Most contain a magnetic substance that may create interference with the pacemaker. Keep the headphones at least 1.2 inches (3 cm) away from the pacemaker (neck). Metal detectors and consumer appliances (e.g. radios, microwave oven…): Only a small chance of causing interference. Magnetic Resonance Imaging (MRI): Modern pacemakers are compatible with MRI exams. All the pacemakers we implant nowadays are compatible with MRI. Cremation: Cremation is often elected for most dogs when the end comes. The pacemaker (generator) must be removed prior to cremation since there is risk of explosion of the battery.